During my window shopping venture, I saw a few spring coats that I really liked and thought about purchasing one. However, that was thwarted when I remembered my 2015 RTW fast. Back at home, pulled out my UFO M6657 that had been sitting nearly finished since 2014, with the plan of having the buttonholes done professionally at Jonathan Embroidery Plus. That never came to be and with my reluctance to travel uptown, I decided to give the buttonhole making a try, being that recently, I'd managed to make a few on my latest garments without too much trouble. For M6657 I used a reversible plaid/n. blue fabric purchased in 2013 at PS Fabric. Initially, I had grandiose plans for making a reversible coat and all that shimmer, but unable or better yet not suave enough to pull off a reversible coat, I settled for a simple silhouette. 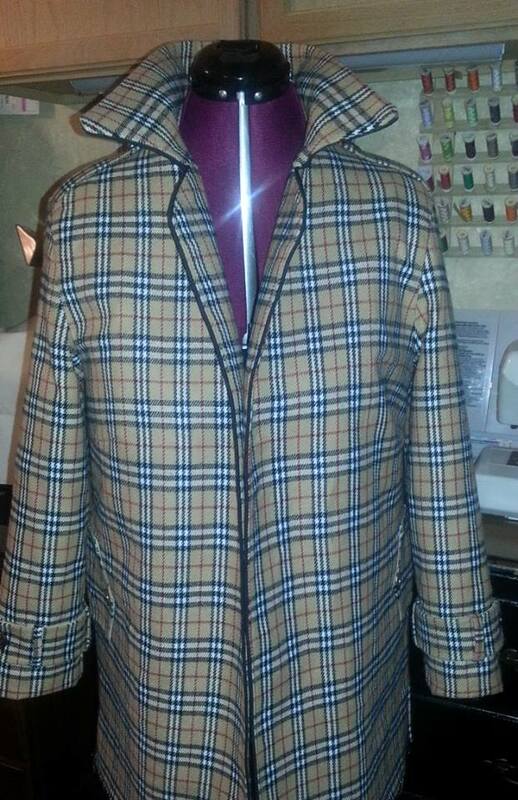 McCalls 6657: Unlined & lined jacket and coat . Jacket/coat is loose fitting with long sleeves; Version C: jacket with standard collar, side pockets and optional toggle closures. 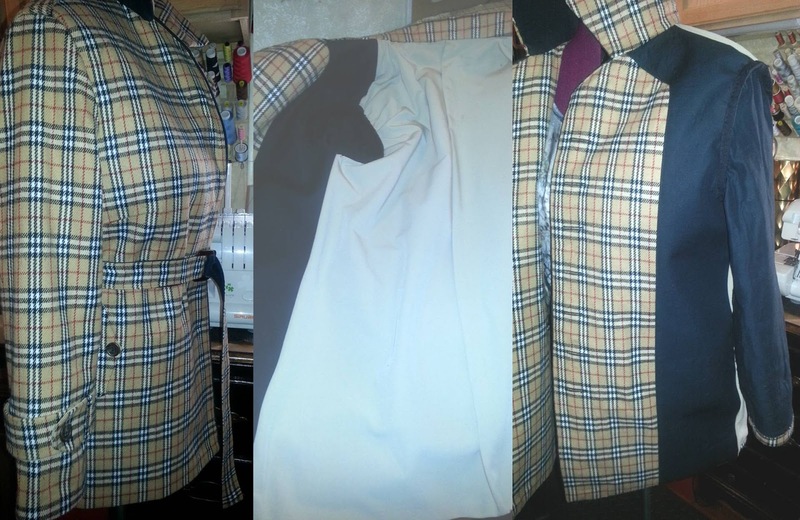 Too add a little something more to the coat, I used shoulder, sleeve & pocket tabs from Mccalls 5525. 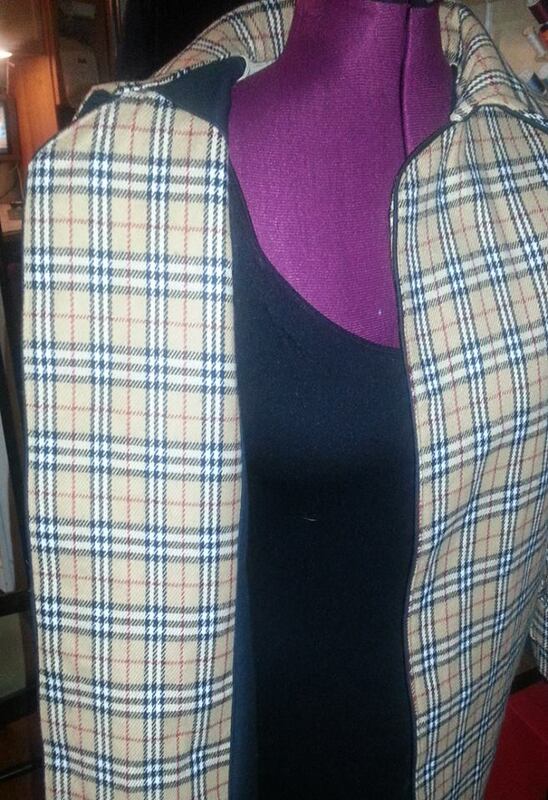 The jacket was lengthened, by how much, its been too long to remember (too lazy to retrieve the pattern with my notes). For the most part, I remember the jacket went together without a hitch. I really wanted a casual coat and settled for the boxiness of the coat, especially being that I would be cinching the waist with a fabric belt. 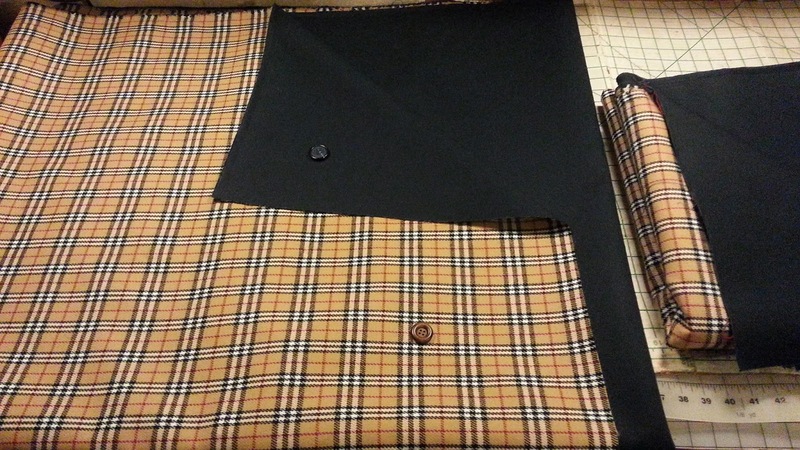 The pattern calls for a center back seam, but due to having to plaid match, I settled for cutting on the fold. As I'd mentioned, I wanted to add a lil somethin' to this simple silhouette and used tabs from Mccalls 5525. As I cut the tabs for the shoulders, sleeves & pockets, I clearly remember encountering a problem. With the fabric being reversible, I found that I needed to remove the n. blue cotton twill backing. In place of that, I used the lining fabric, placing the tab pieces wrong side out and sewing the lining and fabric together, leaving a portion open to turn right side out. Thereby making the tab pieces less bulky and easy to sew onto the coat. For the collar, I separated the n.blue cotton backing, fused the plaid collar piece with interfacing, together with the n. blue cotton backing and with wrong sides out serged upper & lower collar together, then turning right side out. I used the pattern pieces to construct the lining. I used purchased piping between the front edges and facing and side seams. The fabric belt, like the tab pieces, the backing was removed and then sewn wrong side out with an opening left and turned to the right side. When I revisited this UFO and tried it on, I noticed that something was amiss with the sleeves. I tried it on with a variety of tops and jackets and knew something was wrong. Of course, my sewing is not without some general hospital drama. Basted the fabric sleeves back in and thankfully before serging them in, I noticed that the sleeves were in wrong......man, I was too shade from Sunday. But thankfully, I caught my mishap before serging. Again, my sewing is not without some have and have nots... I totally forgot about the belt carriers, with the lining in, the only option left was to sew them by hand to the jacket. Please tell me I am not the only one with sewing drama issues. End result .... I love my casual jacket. Hoping All are Having a Beautiful Easter... Enjoy! 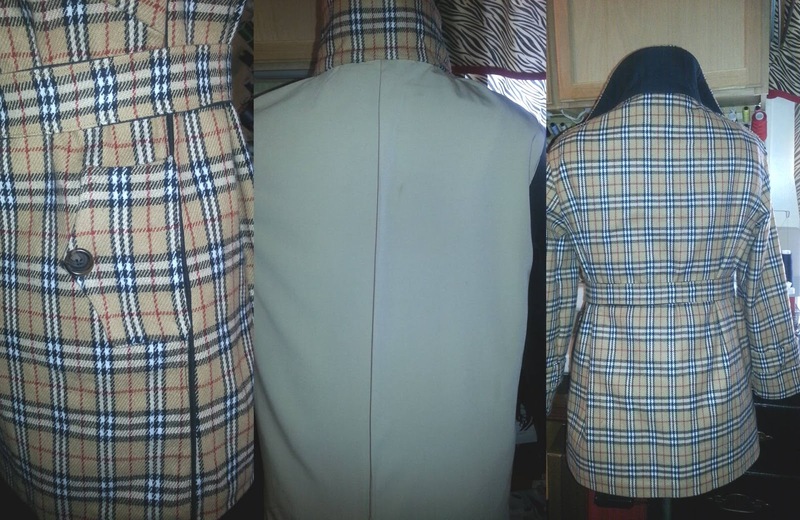 I am sure this jacket was worth the headache. You did a beautiful job. I love your jacket. No you are not alone with drama. I just made a crossover knit top and when I hemmed it put one front to the back. I could not get into that thing! Had to rip out the hem. You did a wonderful job Sheila - it's matching everywhere. Great job with this jacket!!! You are not the only one with sewing drama issues!! That jacket is amazing! It looks so cool. Love your style!! Very nice...and beats anything you might have purchased retail! Beautiful coat Sheila! You will get lots of wear out of it. Enjoy. Savannah wants a little one. It's absolutely gorgeous! Love the plaid! You are on point with the plaid! I love this coat and want some of that fabric! I have all kinds of sewing issues. All. Kinds. The biggest is finishing. This is a beautiful jacket! Talking about drama, just view my page. Enjoy your jacket. The coat is so stylish! I feel like I have to redo things all the time, but it is worth it when you get such a lovely garment! I LOVE your jacket! I love all the extras that you did to make it just what you wanted, namely the tabs! And, cudos to you for following through with those buttonholes! More cudos for even completing this UFO! I'm on a mission right now to do the same. BTW, just know, you are definitely not the only one with sewing issues and "hospital" drama, LOL! I recently experienced about the same thing you did, debating whether or not to reopen the lining just to stopstitch what I forgot to do. I was so tempted to just hand sew in place, but because it was not my own, I sucked it up and opened the lining and took care of it. But, if it was mine...you know the rest, lol!! Great job on the jacket and as usual, it looks fabulous on you!! Love! Love! Love! You've done a fantastic job. Your work is amazing.